Pencils Down, Pass the Remote: So, the last five episodes of "Miracle Day" were irrelevant? So, the last five episodes of "Miracle Day" were irrelevant? Jack and Angelo on the run. Photo courtesy of digitalspy.com. 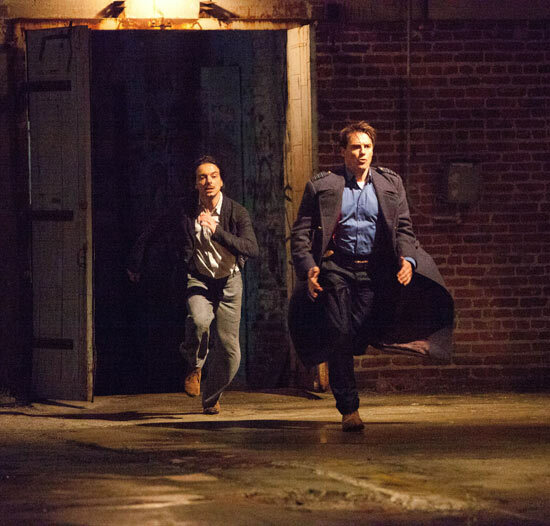 "Immortal Sins," the most recent episode of Torchwood: Miracle Day was awesome. Maybe not Children of Earth awesome, but in the context of the current, lackluster season, it was a breath of fresh air. The episode focused almost solely on Gwen and Jack with an absolute minimum of Rex and Esther, it featured some classic Russell T. Davies boundary-pushing, man-on-man action, and it actually advanced the plot in a meaningful way. The only problem was that the plot development rendered the previous five episodes - everything since the season premiere - completely irrelevant. But let's star with the good. (Warning: SPOILERS ahead if you havent's seen "Immortal Sins".) The renewed focus on Jack and Gwen and their always-complicated relationship was excellent, allowing for some lovely emotional moments and a nice dose of character development. Eve Myles did a great job with the tricky beat where she described how she "got off" on her work with Torchwood, how it had hardened and made the deaths of Tosh, Owen and Ianto seem somewhow worth it. It was an excellent, dark spin on the way she described Torchwood in the opening episode of Children of Earth; if "the whole wide world is bigger," then the value of the people who inhabit that world begins to lessen. Both Myles and Barrowman also did a great job selling the scene where they both vow to sacrifice each other in order to save what's most important: Gwen's daughter and Jack's life, respectively. Myles made Gwen's desperation palpable, but I was most impressed - not to mention disturbed - by Jack's coldness and absolute selfishness. If you've never watched Doctor Who you've never seen a mortal Jack before, a Jack who actually has something to lose. Even for those of us who remember mortal Jack, this new callousness is shocking. I wonder if Gwen and Jack's relationship can ever recover. The real developments of the night - the ones that create so many problems with the previous five episodes - happen during flashbacks to the 1920s. Over the course of the episodes we see Jack meet, seduce, freak out and ultimately get betrayed by Angelo Colasanto (Daniele Favilli), a young Italian immigrant who, we learn at the end of the episode, is still alive and has information about the Miracle, presumably because he's behind it. This is a pretty fantastic plot development, because it ties the Miracle directly to Jack. The fact that Angelo obviously has something to do with it, along with a conspicuous shot of a women holding a bottle of Jack's blood, seems to imply that Angelo and his allies (which hopefully include Phicirp, just to keep that story from being completely pointless) managed to synthesize something from the blood that keeps people from dying. I'm not sure that I buy that being a fixed point in time and space - something I always equated to Earth in The Hitchhiker's Guide to the Galaxy series being like a bubble in wallpaper that always comes back no matter how many times you push it down - is something you can find in blood, but I'm willing to go with it for the sake of the story. The problem with the revelation about Angelo, fascinating as it is, is that it invalidates every episode since the premiere. Why did we spend so much time with Phicorp and the overflow camps when it really got us no closer to the solution to the Miracle? This is the first episode in a while that's actually left me eager to watch next week, but it's also frustrating to know that so much of the season has been a waste of time. Clearly, Davies needs to stick to either episodic television or five-episode, Children of Earth-style arcs. Jack's new willingness to protect his own life at all costs provides a terrible answer to a burning question from Children of Earth - why did Jack take Ianto into Thames House, knowing what he did about the 456? It's starting to look like he either didn't care at all, or didn't care enough. On the other hand, his description of the short-lived Firebird was gorgeous, and the idea of a creature that only lives for a moment is a resonant one for an immortal. Rex and Esther actually did something useful this week! Yay for the return of PC Andy Davidson! I love him. "You're Welsh. You wouldn't notice if all the vowels were missing."